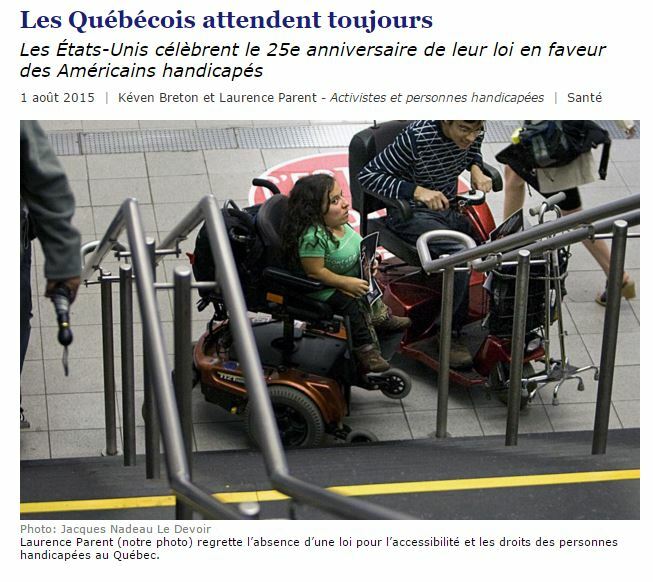 An open letter was published in Le Devoir about the need for a law on accessibility in Québec. Laurence Parent and Kéven Breton compare the situation in Québec with the Unites States where the Americans with Disabilities Act celebrated its 25th anniversary. Share it with all you friends! Click here to read the letter (in French). The Americans with Disabilities Act turns 25! This year, the Americans with Disabilities Act celebrated its 25th anniversary. Activities were organized throughout the United States and while people recognized that a lot of work still has to be done, they still take pride in this law. Click here to read more about the ADA or its 25th anniversary.